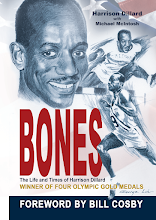 Larry James won a gold medal in the 4x400 meter relay at the 1968 Mexico City Games. He also won a silver medal in the 400 meters, finishing second to Lee Evans in a 1-2-3 USA sweep. Both Evans and James ran sub-44 and both broke the existing World Record. 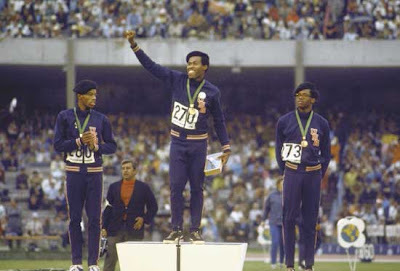 That world record technically belonged to James himself: he had set the official 400 meter world record at the 1968 US Olympic Trials, despite finishing second to Lee Evans. There, the Might Burner ran 44.1 to Evans' 44.0, but what would have been Evans' world record was disallowed due to his use of unsanctioned spikes. The record, as result, went to James. These two giants of the quarter mile went 1-2 again in Mexico City, with both again under the existing world record. After Mexico City, James returned to Villanova having cemented himself as one of the program's icons. He won three NCAA titles at that distance after the 1968 Games, adding to the title he won in 1968. Here is the 400 meter final, with James in lane 2.